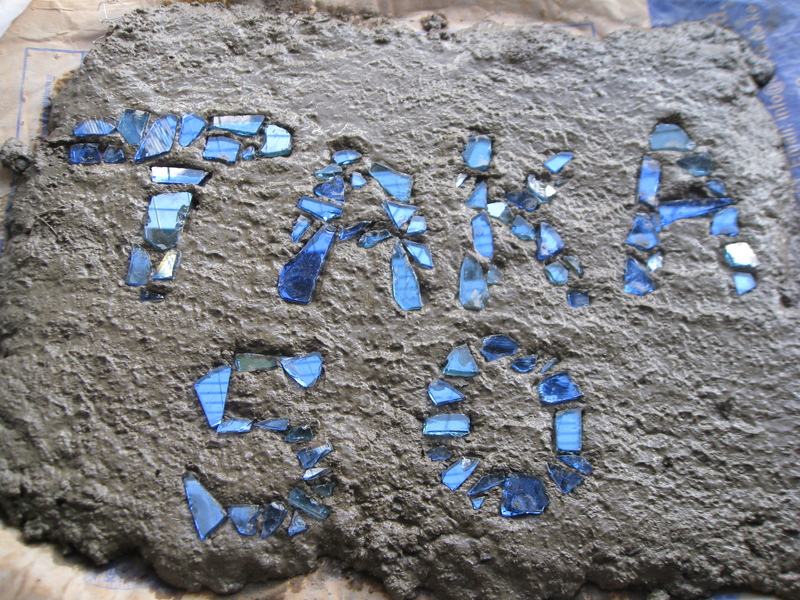 We have just launched our site at www.takamotobiogas.com where you can continue to follow our blog and learn more about our projects, our team and connect with us on our social media pages. Please visit us and subscribe to our blog from that page. Thank you! NAIROBI, KENYA—I have yet to see a biogas company that brands their systems. Companies spend weeks building the anaerobic digester and accompanying tanks but never indicate who did all the work. Which seems like a huge missed opportunity. If we put our name and phone number on the side of digesters we could get our name out there and the friends of our satisfied customers would be immediately aware of who had done the work and what number to call for the same work to be done at their house. Moreover, we would be held accountable for our work. To do this, I had to come up with a design. But then the paint has to be repainted every 2 years because it will fade and then peel. And, besides, everyone is doing it. 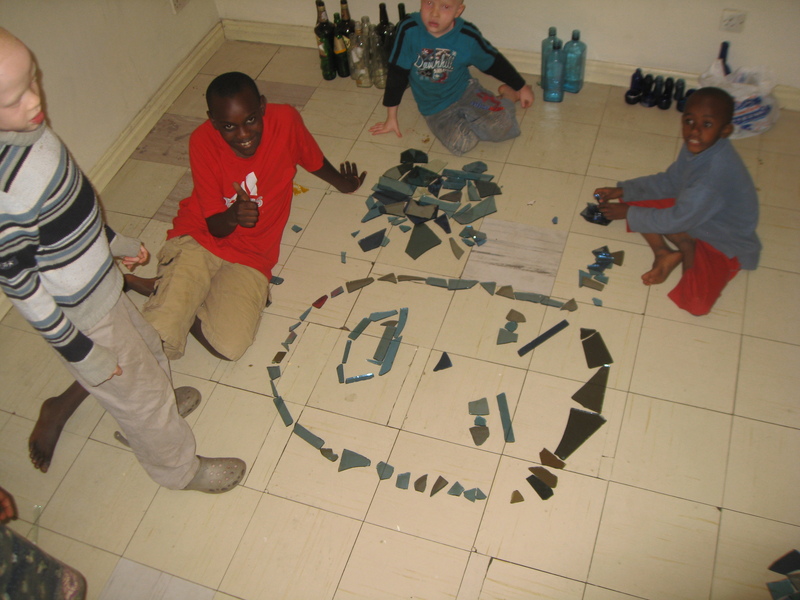 Since our thing is turning waste into resources I thought we could use discarded glass and build our logo with a mosaic of glass pieces of various colors. I went back to the dumpsite and talked to the scavengers about the price of glass (about 2 US cents per kg). But what I really wanted was blue glass (cause it is just so pretty, isn’t it?). That was going to be more difficult as SKYY Vodka and Bombay Sapphire are the main blue bottles and there aren’t a lot of them. I think I ended up paying 20 US cents per kg of blue glass when I picked it up a week later. Another scavenger brought me bluish, mirrored glass which I think is from glass buildings. There are a few kids at my apartment that come over from time to time. Since I have more rooms than items of furniture, sometimes we do gymnastics or “kah-rah-tay” in my living room. The kids saw the glass and where instantly inspired. I tried setting the glass in cement (see top photo), but that didn’t work out so well because the cement was so lumpy. It was difficult to press the glass into the cement. I did some research and found that grout (used for tiling bathrooms and the like) might be better to use. 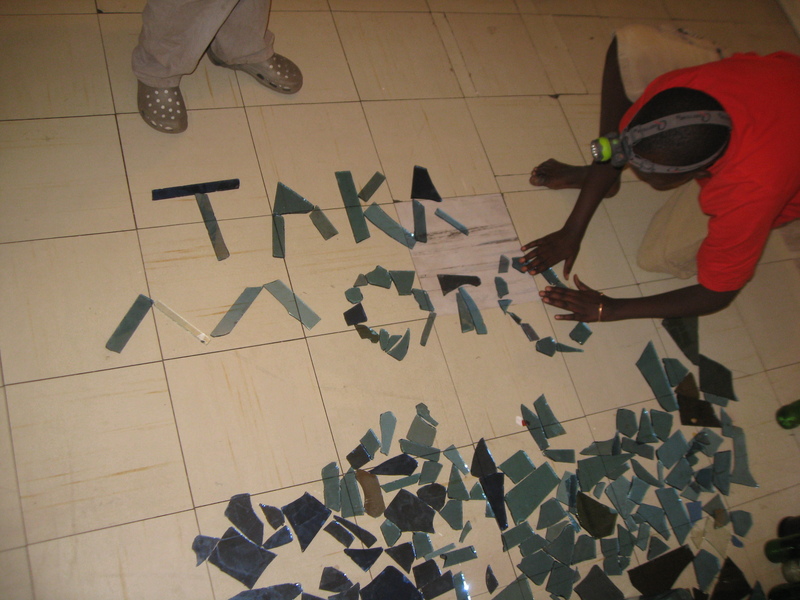 The other challenge with this idea for pasting our logo on everything we do is that it is time consuming. Maybe there is a way to make a bunch at one time in the city on some kind of wire mesh and then pack and ship them. Let me know if anyone out there has seen something like this before. NAIROBI, KENYA—If you are in Nairobi for a visit, even if you go on a safari, it is worth it to visit the David Sheldrick Elephant Orphanage. It costs KES 500 (about $7) and the elephants are really cute! Two years old and already 400 pounds. The keepers sorta become the mothers of the elephants and must sleep in the same room as the elephants every night. One keeper said that in the mornings if he doesn’t wake up at the right time (according to the elephant), the elephant will moisten the trunk and poke the keepers face. If that doesnt work, the elephant might grab the keepers blanket and rip it off the bed. The elephants are very playful. They kick a soccer ball around, fight over sticks and throw dust on their backs. I wish I could bring one home. If you want to visit them, you can visit at 11am any day of the week. The orphanage is off Magadi Rd. NAIROBI, KENYA—Kenya is ranked 125th on the World Bank index of places to do business. Some people think “corruption” and “business in Kenya” belong in the same sentence. But based on the past two months that I have spent obtaining the necessary documents to start a company I think this is an outdate perception. But the process is not so straightforward. I hope this post can help navigate business registration for expats and can provide a good deal of humor to those who have intelligently declined to start a company in a developing country. I wanted to write this after the process is complete, but the process has so many steps that I am sure I will forget some if I wait any longer. A company in Kenya must have two directors and one of them must be Kenyan. For a long time, I incorrectly thought that money was going to be the biggest challenge in starting a company. But that isn’t true. Finding the right people is the most difficult part of starting a company. I have not found the right partner yet but a Kenyan friend offered to be my partner for official reasons in the interim. The first step to registering a business is to perform a “name search.” To do so, go to Sheria House on Harambee Avenue. My co-director said that when she registered her company 10 years ago she had to pay a bribe just to get past the guards at the door. But we had no trouble and the guards even directed us to an in-house lawyer who could answer our questions about the procedure of registering a company. I think it was room 15 on the ground floor. She offered to register the business for me for KES 20,000 (~$250). I said I would think about it. When she was out of earshot her page, David, said he could have the company registered for KES 17,500 (~$210). But that sounded a little sketchy. In fact, the first time I met him he said we could meet at a restaurant. Worried that he might not have a legitimate business, I asked him where his office was. Oh, he said, it is upstairs. Well, why don’t we meet there. He thought about and said ok. We went upstairs and he took me to a barber shop. That was his office I guess. I have heard that the Commercial Section of the US Embassy can help get a business started. I visited and, though they were very kind, they were not very helpful for getting a business started on a budget. I wrote out a list of activities I wanted our company able to perform: biogas construction, sale of carbon credits, biogas accessory manufacturing, consulting, etc. In the actual Articles of Association the lawyer added the gamut of business activities including firefighting equipment and sensors, kitchen and hospital equipment, carrying on the business of a meat salesman, etc etc etc. For 7 pages! Whatever. As long as I can do what I want to do. Expats need a work permit to work in Kenya. But if you want to be self-employed you need to register your business first. There are two work permits applicable in my case. The Class A is for people offered specific employment at a company and costs KES 100,000 per year (~$1,2000!!!!). The Class H is for investors who can prove that they have $100,000 in a Kenyan bank account (who in their right mind would put $100,000 in a single Kenyan bank account?) and costs KES 50,000 per year (~$600). Obviously I was only qualified for the Class A, but I didn’t have enough money for either. I thought there must be a work permit for consultants who come to Kenya for only a few months. And there is. It is called a Special Pass Work Permit. It lasts for three months and costs a quarter the price of the Class A permit. Good enough to get started. Before entering the work permit application process, I asked around to see what my chances were. Not good, I was told. Without a contact in Immigration or sizable bribe it could take months if ever, many concluded. An American friend who also went for a Special Pass had a contact in Immigration who pushed the application through. The father of a friend said it wouldn’t be easy. The co-director of my newly formed company said her cousin knew someone in Immigration but that never panned out. I started to wonder if I would be able to work in Kenya using only legal means. My intention was to work in Kenya to help the country but if I was just perpetuating corruption then maybe I should go somewhere else. In the end I just decided to walk in and plead my case, which turned out to be much easier than everyone was telling me. The day after I received my Certificate of Incorporation I went to Nyayo House on Kenyatta Avenue to apply for my Special Pass. (Nyayo House is the building the right at the top of this post.) For short bit of history, it is widely known among Kenyans that the current Prime Minister of Kenya was tortured in Nyayo House by the former President of Kenya, Moi. Moi has not received more than a slap on the wrist for any of his misdoings during his 25 year democratically rigged dictatorship. The left side of Nyayo House is for non-Kenyans. The man at the counter seemed like the general apathetic government worker until I told him that my company builds biogas systems. He became quite excited and told me that his village needs a biogas system and as soon as I have my paper work he wanted me to build one. He gave me his phone number and helped me to check on my application status from time to time. According to the Special Pass instructions on the form I needed copies of my passport, two passport photos and a cover letter asking Immigration to let me hire myself. The letter went something like this. Please grant Kyle Schutter a special pass to work for Takamoto Biogas Ltd. Takamoto is a biogas company that will bring $100,000 of investment and provide 50 jobs in the first year. I just crossed my fingers that I could hire myself. It felt a little like how Ra, the Egyptian god of the sun, gave birth to himself to create the world. I was the most authoritative figure at a company where I was not allowed to work. But the man at Immigration said I was missing one piece of paper—something that became a mantra. I needed a copy of my graduation certificate. Well, it was 1 am in the morning in Philadelphia where I believed my graduation certificate resided. My mom said if there was ever an emergency I should let her know, day or night. And this was an emergency! I thought. They emailed a copy to me and I was able to apply for my special pass that very same day. Fortunately, the applicant need only pay after the permit has been granted. If the permit is denied there is no charge. I called my contact at immigration two weeks after applying (as he had instructed) and discovered that I was missing more documents. My application had been stalled a week before, but I was never notified. I needed to provide a new cover letter that was signed and dated, a CV and the company registration certificate. Why couldn’t they tell me that before? I went to room 523 to supply the needed documents. The officer in the room is nearly always at lunch, I discovered. But there is a man there with no authority who is nearly always there. I don’t know his name but it seems that this job has nearly broken him. The people I meet in these government offices are very interesting. The job has caused their spirit to decompose from the inside out, which manifests itself in different ways. Sometimes it is short temper. Sometimes they take extended lunch breaks as a means of self preservation. This time it was total apathy. Runners have finished a marathon with less pain than this man filed through the “T” section of the records to find my application. I had to wait for the head officer to return from lunch before I could present the new documents. The other man did not have the qualifications to receive the documents. Before I left, I asked the two officials “if there is anything wrong with my application please give me call immediately.” Blank stares. It was worth a shot. Okay, just give me your number so I can call you. After a while I was given the number for Nyayo House: 0202222022 and the extension for room 523 is 22090. No one will answer the phone. You have to dial the extension while the phone is ringing. Even then no one answered the phone. I could tell that if I spent much more time in Nyayo House, I too would give up on life. A week later I called the guy I met at the front counter and he let me know my Special Pass was ready! WOO! I was almost ready to be deported. The apathetic guy in room 523 pulled out my application he said “I can’t pronounce your name.” I looked at the name on the pass and to my horror saw that it read “Kyle David Scgyttrr.” Well, thats not my name. After I badgered him for a while he said it could be retyped on the same day. He also let me know that to pay I would need to obtain a bankers check addressed to “Director of Immigration Services”. Why don’t they write these things on the application? The difficulty is that to have a bank account in Kenya you need to have a work permit. And now to get a work permit you need to have a bankers check. And to get a bankers check you need to have a bank account. At least for most banks. Equity Bank (God bless their divine souls!) will write a bankers check for a flat fee of KES 100 (~$1.25) to any bum off the street. I rushed back to room 523 with my bankers check but it was too late. The officer was out to lunch again. After pleading with the apathetic man for a while he agreed to sign my payment slip so that I could go downstairs and pay for the Special Pass, though he said the cashier wouldn’t accept it. Whatever. Downstairs, the cashier accepted my money. Two days later I returned to pick up my pass at room 016 but the official let me know that nothing had arrived. Could you check for me? Nothing has arrived. Could I have a number to call when it arrives? 0202222022 x22079. This number also doesn’t work. I checked for my pass again two days later and found that it had arrived on the day before I checked the first time. Honestly, you can never badger the immigration officials enough. I might have had my pass three days earlier. To reenter the country with a work permit of any sort you need a reentry pass (which no one will tell you about unless you ask). It only costs KES 200 (~$2.50) and takes only 20 minutes to receive but if you don’t have it you won’t be allowed back in the country. FY-friggin-I. After that, I thought I was done with Nyayo House for good. For me, the obvious choice is Equity Bank. I say “is” because I haven’t been able to open an account yet. But I can’t really blame Equity for that. I am not their target client. Equity is not really geared for running at the expat RPM. It is for the average Kenyan. Of the 40+ banks in Kenya, Equity banks over 50% of Kenyans with a bank account. And that has happened in about the last 10 years. Someday I want to write a whole post on how Equity is reshaping Kenya. There are many banks to choose from in Kenya but I think of the choice like deciding between Friendster and Facebook. Like living in Cleveland or living in San Francisco. The people working at Equity are motivated and helpful because they feel that they are making a difference in Kenya. To open a personal account with Equity you need a letter of introduction from a current Equity Account holder who has known you for more than 12 months. Which makes a lot of sense for the average Equity customer who is a farmer without a postal address and without a banking history. But as an expat, there is only one person I have known in Kenya for more than 12 months and she does not have an Equity account. So we will have to finagle that one. You also need to have a work permit and two copies of your passport and two copies of your work permit. I couldn’t open a bank account until I had a work permit so that was really slowing me down. Imagine trying to run a business with only an ATM card. The accounting is a biatch. And you need a PO Box. And you need an Alien ID card. By the way. To open a business account with Equity in addition to the above you also need to show your original Articles of Association and Certificate of Incorporation as well as copies of every page of both documents. The co-Director(s) of the company also must to be present. I have not been able to open the account yet because 1.) I lacked a PO Box and 2.) some Equity Banks say I need an Alien ID as well. I went to the big Post Office in town, GPO, to inquire about a PO Box. (The GPO is the building on the left at the top of this post.) It costs KES 1,700 per year (~$20) for a personal box or KES 4,500 per year (~$55) for a corporate box. But there aren’t any available, the clerk let me know. There is a long waiting list. Great. So I can’t run my company because I can’t get a PO Box! I called the Post Office near my home and all the boxes there were taken as well. Then the clerk whispered to me that he could help me push my application through when his manager was gone. I should just leave him my number. I am curious to see what he wants in return. Update: I visited the clerk the following Saturday. He is starting a company and is looking for business contacts. He had my PO Box ready the following Monday. Then I returned to Nyayo to see about getting an Alien ID. (An Alien ID also grants the bearer a ~90% discount at the national parks so I wanted to get one anyway.) The registration costs KES 2,000 (~$25) and takes 6 weeks to process! By that time I will already be in the US. But if you ask, Immigration will give you a slip of paper that indicates your Alien ID card is being processed and should be enough documentation for the bank (according to Immigration). On this trip back to Nyayo House I met the other type of government official. Where his soul has been replaced by a short temper. Because he couldn’t pronounce my first name he called me “David.” When I didn’t respond he asked if I even knew my own name. While he was taking my finger prints he called me “a bad engineer.” I tried to get him to explain why and it had something to do with how I was holding my cell phone. I asked him why he was such a grouch today and he laughed, so I guess that is good. Update: the slip Immigration will give you is NOT good enough for opening a bank account. At one Equity Branch the man at the desk said I would have to wait until my Alien ID was ready. Then I went to the Equity Branch at NHIF House and had no trouble signing up for an account. Okay, thats not true. Equity told me I needed to register my company with Kenya Revenue Authority (at Times Tower on Haile Selassie Avenue, see below) before I could get a bank account so I had to come back the next day. Overall the process of registering a business, obtaining and work permit and opening a bank account takes about two months, which I don’ think is so bad. And besides I met a bunch of interesting people along the way who proved to me that I am glad I am not working for the government. I saved myself a bit of time dashing around by making many copies of all of my documents and keeping those documents with me. I was always pleased when an immigration official would firmly tell me that I was missing a copy of something and would have to come back another day. Then I would swing my backpack around and produce the required copies, which always surprised them. Make 20 copies of your passport, 20 copies of your work permit, get 10 passport sized photos, make 3 copies of your Articles of Association and 5 copies of your Certificate of Incorporation. Also get a PO Box or find a friend who will let you use their PO Box. You will need it to rent a house and sign up for electricity as well. Make copies of your Graduation Diploma, and keep a few copies of your CV handy. Badger the immigration officials until they answer your questions. And enjoy the process and the people you meet! NAIROBI, KENYA—…at the School of Hard Knocks! I registered my company in Kenya and we have completed our first project: a biogas digester for a farmer with 6 cows. I even have a work permit! Though the immigration office had to reprint my work permit since they spelled my name “Kyle David Scgyttrr” the first time. Over a year ago, three classmates at Brown and I did an independent study where we wrote a business plan to form a biogas company in Nigeria. From last June until now I have enjoyed my status of being “self-unemployed” while blogging on my experiences as a “toilet tourist” in the US, Ghana, Uganda, Rwanda and Kenya. If you have read even half of those posts you deserve a gold star!﻿ I never reached Nigeria for a variety of reasons but I have found a land of opportunity in Kenya﻿. I think I will be here for the next few years. The company name is Takamoto Biogas Ltd. Yes, it sounds Japanese. I have always thought that Japanese last names sounded so perfect, especially four syllable last names. I thought that calling our first son “Yamazaki” was a great idea but my then girlfriend objected, for some reason. 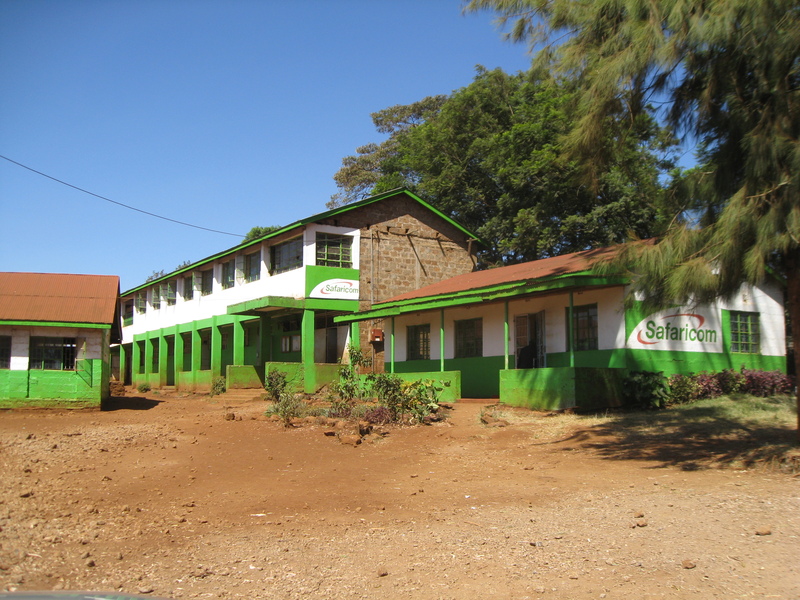 The name also means something in Swahili, the second official language of Kenya. If you say “na taka moto” it sounds like “I want fire” and “taka moto” could also mean “fire from waste,” which explains biogas pretty well. Waste goes in, fire comes out. I will have a post coming very shortly about the progress we have made so far. Thanks to everyone who brought me this far—especially my classmates at Brown who went along with the crazy idea of turning human waste into cooking fuel. And my family of course too!